Hercules is a family based business out of Wills Point, Texas, and we plan to continue bringing our family values to the workplace every day to provide you with the best fiberglass hunting blinds. 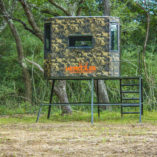 Located a little over fifty miles from Dallas in Wills Point, Texas, Hercules Hunting Blinds is the new leader in the hunting blind business. Our blinds are developed and built by hunters just like you. Our mission is to make the toughest blinds that come with all the creature comforts you need. 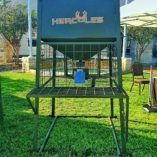 We at Hercules believe strongly in the promotion of our youth hunting and preserving the traditions past down from generations. Our blinds are manufactured with that in mind. Fiberglass hunting blinds are the way to go when hunting any animal. You don't have to be an expert hunter when you go hunting in a box blind. It sure is nice to sit down in a comfortable chair and relax, watch nature and all its glory and let the game come to you. Box blinds hide you, shield your movements and provide a restful place while waiting patiently. Texas tough, and American-made, our fiberglass hunting blinds will last you a lifetime. 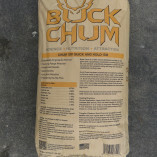 If you're too busy to hunt...than you're too busy!! Jordan Shipley with the Buck of Tecomate and his input on the Hercules Blinds. AMEN!! How many days till your season opens? Don't be fooled by others...Whitetail Diaries goes in depth on why Hercules Blinds™ stand out from the competition. 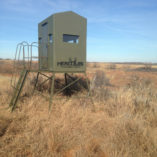 Hercules Outdoor Industries Hunting Blinds can last through rain, snow and all those cold winters spent hunting at the peak of the season. 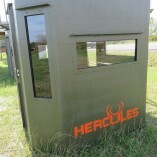 You haven’t been hunting, until you’ve been hunting in a Hercules Hunting Blind! — Products shown: 6×8 Blind and 6×6 Blind. And don’t forget to check out #HerculesAdventures!